Disasters and humanitarian crises affected millions of people globally in 2016. Hurricane Matthew caused widespread devastation in Haiti and several islands in the Caribbean, as well as the southeastern parts of the United States. An earthquake struck the coast of Ecuador in April, the worst natural disaster to hit the country since 1949, killing hundreds and injuring thousands of people. Civil unrest in Syria and Yemen continued, further increasing the number of refugees, asylum seekers, and internally displaced people. In the United States, destructive storms and flooding affected Louisiana, West Virginia, Texas, and Maryland. Deadly wildfires burned through thousands of acres of national park in Tennessee. In January 2016, the Obama administration declared a state of emergency over contamination of drinking water in Flint, Michigan. Each year, the Center for Disaster Philanthropy and Foundation Center analyze global disaster-related funding from foundations, bilateral and multilateral donors, the U.S. federal government, corporations, and smaller donors who give through donor-advised funds and online platforms. We analyze funding according to a taxonomy that classifies giving by type of disaster and disaster assistance strategy. In this year’s report, for the first time, we examine funding beyond the largest U.S. foundations and include in the overall analysis contributions by non-U.S. donors, public charities, and smaller U.S. foundations. This enables us to see a much broader picture of institutional disaster philanthropy. Drawing upon twelve data sources, we documented almost $30 billion in disaster-related giving in 2016. We specifically identified $199.9 million in funding by foundations and public charities for disasters and humanitarian crises, based on Foundation Center’s database; this includes transactions by U.S. and non-U.S. donors. Natural disasters accounted for 44 percent of disaster funding; 16 percent was for flooding, particularly in Louisiana. Man-made accidents received 15 percent, with several large grants addressing the Flint water crisis. Among disaster assistance strategies, 42 percent of dollars were for response and relief efforts. Seventeen percent went toward reconstruction and recovery—more than half of this was related, again, to the Flint water crisis. Eight percent went toward resilience measures, and five percent was allocated for disaster preparedness. Foundations contributed an average $150.4 million per year specifically for disasters. Funding spiked in 2014 due to large grants for the Ebola outbreak, then declined over the next two years. Disaster funding was largely focused on natural disasters (59 percent on average). Man-made accidents accounted for no more than 3 percent of dollars in every year except in 2016, when funding jumped to 20 percent, due to the Flint water crisis. Response and relief efforts were the most funded assistance strategy across all years, averaging 47 percent of all disaster funding. Recovery efforts increased in 2013 after Superstorm Sandy and in 2016 following the Flint water crisis. Resilience and risk reduction funding increased in 2015 in the wake of the Ebola outbreak. Official development assistance by 29 government members of the Organisation for Economic Co-operation and Development’s Development Assistance Committee (DAC) totaled $19.6 billion for disasters and humanitarian crises in 2016, a nearly $3 billion increase from the prior year. Non-DAC government donors and multilateral organizations contributed an additional $1.8 billion. FEMA distributed $3.7 billion for U.S. disasters in 2016, a $1.5 billion increase from the prior year. HUD (Housing and Urban Development) allocated $352.9 million in recovery efforts. Based on available data, corporate giving programs committed at least $148.1 million to disasters and humanitarian crises, through both cash and in-kind donations. Development Initiatives, publisher of the Global Humanitarian Assistance Report, reported an estimated $4.1 billion in private donations by individuals for international humanitarian crises. Individual donors contributed $8.2 million through donor-advised funds managed by Fidelity Charitable and $661,900 through donor-advised funds managed by Vanguard Charitable. Many individual donors also gave through online platforms like Network for Good and GlobalGiving. Network for Good helped direct $6.8 million in donations to disaster-specific nonprofits. GlobalGiving raised $3.8 million for disasters, supporting 162 projects by 127 organizations. We hope this analysis will aid donors in considering how to maximize the impact of their disaster-related giving. With the generous support of The Irene W. and C.B. 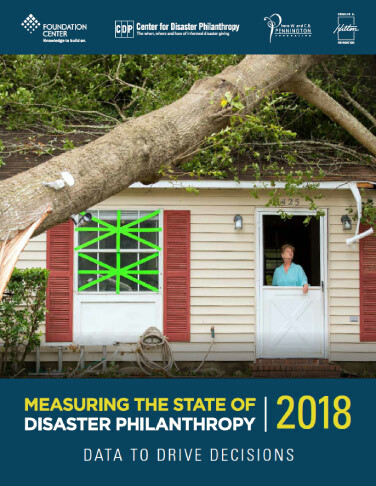 Pennington Foundation and the Conrad N. Hilton Foundation, the Center for Disaster Philanthropy and Foundation Center produce this annual analysis of funding for disasters and humanitarian crises.